If We’re Holy, Why Does God Call Us to Be Holy? Are Christians a truly holy people, or are we trying to become a holy people?… As an oak sapling grows, it doesn’t get “oakier.” Oak is oak. It simply matures into what it is, a full-grown oak tree. Needless to say, maturity doesn’t occur in one giant leap, but through a process: “But we all … are being transformed into the same image from glory to glory” (2 Corinthians 3:18). Notice it’s “from glory to glory,” not “from garbage to glory.” You are already holy in Christ … Just as an oak sapling does not get oakier as it matures, neither does a new creature in Christ get holier, more forgiven, more accepted, etc. Critics of the modern grace message say we who preach it are opposed to holy living. Nothing could be further from the truth. What we are opposed to is the old habit of trying to make yourself holy by acting holy. You just can’t do it. The standard is too high. But the good news declares God makes us holy. He takes the shards of our broken lives and makes something beautiful, pleasing, sweet-smelling, and Christ-like. To all those in Rome who are loved by God and called to be saints (Romans 1:7a, ESV). Be saintly because you are saints, as Paul says many times in his letter to the Romans. But now that you have been set free from sin and have become slaves to God, the benefit you reap leads to holiness, and the result is eternal life (Romans 6:22). A better translation may be, “have fruit unto sanctification.” Holy fruit are reaped not manufactured. Like eternal life, fruit are gifts, not wages (John 3:16, 5:21). To the church of God in Corinth, to those sanctified in Christ Jesus and called to be His holy people … (1 Corinthians 1:2a). You are sanctified so act like it. Put to death, therefore, whatever belongs to your earthly nature: sexual immorality, impurity … (Colossians 3:5a). If you’re a butterfly, don’t act like a caterpillar. If you have been given a new nature, don’t act in accordance with your old one. That’s hypocrisy. It’s pretending to be someone you are not. It is God’s will that you should be sanctified: that you should avoid sexual immorality … (1 Thessalonians 4:3). It is God’s will that you should be sanctified in your conduct, not because your salvation hinges on it, but your wellbeing does. Sin is destructive. Each of you should learn to control your own body in a way that is holy and honorable, not in passionate lust like the pagans, who do not know God (1 Thessalonians 4:4–5). You know who your Father is so don’t act like someone who doesn’t. May God Himself, the God of peace, sanctify you through and through (1 Thessalonians 5:23a). Sanctification is God’s work, not yours. Just as His gift of salvation is something to work out in your life, so is His sanctification. You already have it, so enjoy it! 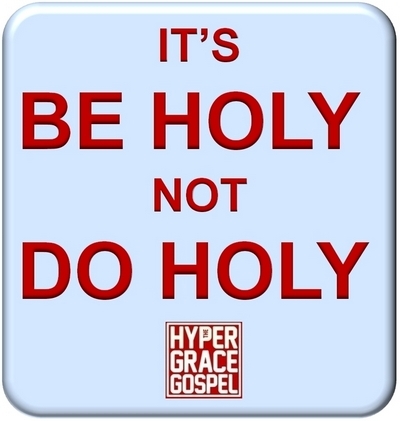 But just as He who called you is holy, so be holy in all you do (1 Peter 1:15). You are not holy because you act holy. You are holy because you are children of a holy Father. Indeed, you are a holy nation (1 Peter 2:9). Be who you truly are. New Testament exhortations to live holy should not be read as a self-help guide to holiness. Rather, they are pictures of the wholesome, healthy life we get to enjoy as we allow Christ to express His holy life through us. New Testament exhortations to live holy are advertisements for the abundant life that is already ours in Christ. Help these messages of hope and grace reach more by supporting us via our Patreon page. 38 Comments on If We’re Holy, Why Does God Call Us to Be Holy? Great explanation and scriptures! So freeing for those who will have ears to hear the truth of God’s grace and love! Thanks, Paul! I totally get the message here. I like how Joseph Prince says, that when you really know who you are in Christ and how much you are loved and forgiven, the old sinful behavior, habits and addictions will fall off. I have found this to be true in my life. My old destructive tongue speaks less because my mind has changed, the negative thoughts are up there in the brain less and less..The old bad habits and addictions have mostly gone away because the Holy Spirit guided me with suggestions as how to break them. When you realize that it is not God that is heaping the condemnation on you, you relax and “know” that you will be victorious in becoming more holy in time… not fretting over it, not “working” at it but just having faith that God will help you overcome in time. Thank you, Paul for another thought provoking message that is so well written. I didn’t mean to say that I would become more holy over time, but that my behavior would be more holy over time, I know that I am already holy because of the Jesus and the Cross..
Hi Paul, great post! Thank you. Amazing that we have these old timers as it were, proclaiming true holiness. Yet the Church never picked up on what they said. I wonder if the critics of the grace message would criticise Billy Graham or Dr Jones message on holiness in the same way they do us grace people! Would they brand them heretics like they do us. I don’t think so. They wouldn’t have the balls! They’d find some way to reason out what Billy and Martin have said! The phrase “be holy” is an interesting one. In English, the verb “be” is the only inactive verb. In order for it to become active, it must be paired with another verb, i.e. “I am going to the store”; or “He was playing the piano.” The phrase “be holy” is to remain as you are……holy. There is nothing to “do”, but to remain as you have been re-created to be in Christ. It took me a long time for Bill Gillham’s words to sink in about this. After meeting him and Anabel one day, we discussed the idea of the oak tree. It is oak. (“Is” is the form of the verb “be”, in case you didn’t catch that.) It doesn’t become oakier as it continues to grow. Just like we, as believers in Christ, are holy, so we are encouraged to remain that way. Not that we can “unbecome” holy, for we “are” holy in Christ. LORD open our eyes so we can see who we really are in Jesus -otherwise we will continue in the futility of false identity perceptions. Amen! As Jesus is, so am I. “The apostle says that we who are the priests of God have a right as priests to go to God’s mercy seat that is within the veil; but it were to our death to go there unless we were perfect. but we are perfect, for the blood of Christ has been sprinkled on us, and, therefore, our standing before God is the standing of perfection. “To be” is not in the original text. They are “called holy people” because that’s who they are. – Just as you used to offer yourselves as slaves to impurity and to ever-increasing wickedness, so now offer yourselves as slaves to righteousness leading to holiness (Romans 6:19b). Indeed, that’s almost exactly how the text reads in the original. “Leading to” is not there in Greek. The preposition is “εἰς” – in / into. It is God’s will that you should be sanctified in your conduct, not because your salvation hinges on it, but your wellbeing does. Sin is destructive. I really love how your already dynamic posts get supercharged when I read through comments. Thank you to Steve & Terminal Salvation for the original language additions. Love the Spurgeon quote about standing perfect in God’s reality vs my conscience. Neil Anderson is good too. OAKINESS. ?…added to my vocabulary but more importantly that’s a great one to meditate upon and store in my heart. When we are in hyper-sin then hyper-grace is the only gospel that can be preached, otherwise the money machine shuts down and you can’t have that in America, right? Holiness is entirely lacking in the house of the LORD today and even the heathen know it. How else can one explain the prostitute type dressing and the immoral attire donned under the guise of fashion? We find that once we dress our daughters unholy this way the whole land falls into whoredom and who can argue with the LORD and the facts on the ground that militate against us? Matt 5:28 is a higher bar indeed than Leviticus 19:29, and sexual sin has absolutely collapsed the church and impeached her credibility. The entire U.S.A. church needs to repent with a sacred national assembly on this one sin alone. Romans 6:12 Therefore do not let sin reign in your mortal body so that you obey its evil desires. That means we have the grace through the blood of the Lamb and the Mighty Holy Spirit to overcome sin: we must it is a command repeated again to the churches in Revelation. And that’s the question, no? If one is not overcoming sin, and repenting then one is in the realm of the flesh and on an entirely different road with a grim destination. You rightly diagnose the moral problems and decay in the world my friend. But your solution of self effort holiness has virtually no foundation in gospel truth. Gods ONLY solution to moral decay in any age is not more of the self imposed superficial religion of outward dress and skin deep moral reformation used by the fathers of America. Where did that lead them? It lead them tto the moral cesspool our society is in today. The Self imposed holiness you propose of is not gospel holiness but rather this: “Beware lest anyone cheat you through philosophy and empty deceit, according to the tradition of men, according to the basic principles of the world, and not according to Christ. 2 or else be like the world, and dress like the world, and think like the world, and minimize sexual sin (Matt 5:28) and immodest dressing. But I must tell you the truth, the Holy Spirit is Holy and the LORD has a ZERO tolerance towards sin. One look at the church and you can see she has not chosen holiness and the fear of the LORD she has taken another road altogether. Repentance of the penance kind only brings short lived self powered change. How do I know? I lived it. You can dress up a pig is children’s clothing and it’s still a pig. However if you change a pig through a supernatural act of God into a child then it is no longer a pig. It may take time for it to learn that it is no longer a pig but a child of God. No matter how badly it may slip back into pig pen behavior those actions do not negate the supernatural act that God wrought making it into a child. Without “hyper-grace” you merely have religious words dressing up the lost with demands to be good, stop sinning and clean up your act. Even if a person grasps the deity of Jesus and that the cross provides forgiveness of sin but you neglect to teach them that they are no longer a pig they will continue to act like pigs because that is all anyone ever tells them they are. “Stop being so filthy you dirty sinner. Get cleaned up. Straighten out.” Until you tell them the scandalous good news of the entire gospel of Jesus(also called hyper grace) you will have a bunch of folks thinking they are pigs that need to change themselves into children of God. Until they know that they are children of God they will operate out of the flesh for their change and maturity. Until the full truth is taught the church will stay full of young women dressing like pigs and young men acting like pigs because no one is brave enough to tell them that God turned them into His children when they believed on Jesus. You will always act out who you think you really are! My whole life is living proof of that. Holiness is of the Lord or it is self righteousness. God’s hiway to Holiness is just that : A HIGHER WAY OF HOLINESS! That comes through trusting Christ’s holiness alone to secure and maintain every divine blessing and Christ’s holiness ALONE lived out and through those who BELIEVE – not those who try hard to be holy. Christ plus nothing is the only authentic HIGH(ER)way to holiness . Highway- You are either full of it OR seriously deluded as to how holy the “holiness” is that God demands. The last thing Jesus prayed for is perfect harmony , between him in the father with us, this can not be achieved if we are not holy, and God defines holy, just as he defines life. If he said it , I am it. I know from experience that when I stopped trying and just accepted that I’m holy and my actions don’t make me holier same as my shortcomings don’t make me less holy, i flew. If the reason for being holy is that I’m already holy, that empowers me to even unconsciously bring forth fruits of holiness. I went almost a month without realising that I hadn’t indulged a particular weakness. It didn’t even cross my mind at all, and that’s because I want trying to stop, the way I had so often in the past. I just focused on Jesus and everything else dimmed in the light of His Love and acceptance. And these days when I am tempted, i say “Father, i can’t but You can” (got that from JP, the testimony a woman gave of how she overcame her addictions). I realise that if I could in my own strength i would have, but I can’t. I can’t but He can. I focus on Jesus’s finished work and magnify Him and not the problem. It’s amazing. I’m so much at peace! 3.3 For you died and your life is hidden with Christ. 3.5 Therefore put to death your members that are on the earth: fornication, uncleanness, passion, evil desire and covetousness which is idoaltry. If we get fed only 3.5 with no reference to the foundation of 3.3 we will end up in legalism. But Paul does not say that we should be passive in our dealing with our sin. We are to put it to death. Being holy is about seeing yourself in the image of Jesus because of His completed work and by the teaching and leading of the Holy Spirit. Keep reading to Col. 3:10. But what are we to make of Col 3.5? Can we just say that 3.10 makes 3.5 redundant? I think everyone would agree the behavior listed in verse 5 is not profitable. The question is, and the question Paul addresses is, how is this type of behavior put to death in a person’s life? Is it by man’s willpower? Well, if it is by man’s willpower, Jesus died in vein. In verse 1, you were raised with Christ and are sitting at the right hand of God. What are you doing there if you’re not holy? In verse 2, set your mind on things above. Does your sin qualify as things above? In verse 3, you died. Are you trying to fix up a dead man? In verse 4, Christ is your life. Can it also be your behavior? Come on Paul, tell us, how do we put this sinful behavior to death? See that old sinful man dead on the cross. See yourself as the new man given to you by Jesus. As Jesus is, so is that new man. Our inner self in new however our flesh is still old. The old has habits and desires that are left over from the old man resided in us. Basically the dynamic is you are currently a new man but your old man’s bad habits are still hanging around and need dealt with. Will not dealing with your sin cost you anything? Not in the eternal perspective but in the temporal yeah probably. The best way to “deal” with your sin is to first get your mind renewed about you new nature and how you are clean and accepted in the Beloved. That and cultivating an ear for the still small voice of the Holy Spirit. Dear Paul , My husband , an elder in a small fellowship . has been told that he is dividing the fellowship over his views on Grace. He and many others are getting the revelation , it seems to be people who have been brought up in the church can’t ‘ hear ‘ it. Please pray for us . Can’t give names , we are in UK. It is very difficult and so sad when this is a revelation that sets people free !! Blessings . Me and Him ! Hi K, sadly this is a story I’ve heard many times before. I will pray. But I would also encourage you not to give up on those who have been brought up in the church. They can hear it – I know, because I’m such a person. What I have observed is people get grace at different speeds and some of us need a little longer than others. It’s important that those of us who do see it have patience and grace for those who don’t see it yet, for if we don’t give them grace, they definitely won’t see grace. It’s hard to stay under a pastor that teaches self help and hardly ever even mentions Jesus. We started our own Grace bible study and eventually had to leave along with all of our fellow members that were in our study. It got to the point that we couldn’t sit through one more dead sermon full of self works . There comes a time when you have no more influence because you are seen as a rebel. and kind of feel like one. because your views are different from the leadership. Praise God for the freedom we feel now. Prayers are powerful, we pray for them and put them in God’s hands. We have not found a total Grace church yet, but have found one that is pretty close. Love this. Thank you. It always comes back to our new identity in Christ. Either where slouching beneath our dignity, or trusting Christ to energize the person he’s already made us to be. Thank you for being faithful to this message. I’m encouraged to read it. Max grace: “Slouching beneath our dignity” I love that phrase! There are only two great motivators in everything in the life of a child of God: fear or grace. I choose grace. well said Barry. I love the two motivators in the life of a child of God. Fear or GRACE….that is true to every one and the sad thing is that most people still lack the understanding of the liberating Gospel of the Grace of God. His undeserved, unearned, unmerited Favor (spiritual Blessing). I love what the scriptures say and JP pointed out (interesting it was from his old auditorium so it was maybe 2 or 3 years ago or so. Maybe a rerun.) Sanctify means to make holy and Paul wrote “he who sanctifies…” (Hebrews 2:11). so He makes us holy (this is the way the NIV reads basically). Then JP said if he heals us we’re healed, if He prospers us we’re prosperous, and if He sanctifies, we’re holy. Love this verse! Though it used to bother me – as an unattainable command – before learning about amazing grace of God. Now – it seems to be a creation command : “Light Be, and there is Light” “Be Holy, and there is Holiness” (through Jesus). Ahhh, rest, gratitude, peace, wonder, amazement…. Awesome article- thank you Dr Paul!